The Super Bowl was full of ads with strong messages about inclusion and acceptance. And that didn't go over well with everyone on social media. Some supporters of President Trump quickly called for boycotts of several companies, including Budweiser, 84 Lumber, Coca-Cola (KO), Airbnb, Kia and Tiffany (TIF). Their ads had messages about immigration, equality and environmentalism. Even the NFL drew calls for a boycott for having Lady Gaga as the halftime show performer. She has called Trump a bully, and she supported Hillary Clinton during the presidential campaign. 84 Lumber's commercial was seen as largely pro-immigration. It featured a Hispanic mother and daughter setting out on a harrowing journey from their home. The television ad directed viewers to a supplement online. The online ad showed the mother and daughter arriving at the U.S. border to find a looming wall. They eventually notice that the wall has a huge door, and they walk through. The ad led some Trump supporters to vow not to shop at the building supply company. @84LumberNews @HILLSBORO_OHIO to all president Trump supporters. I think is time to boycott companies like 84 lumber. MAGA is all we want! One interesting thing about the 84 Lumber boycott is that the company's owner, Maggie Hardy Magerko, said she voted for Trump. In fact, having a huge door in the wall is something Trump himself mentioned repeatedly in campaign speeches. 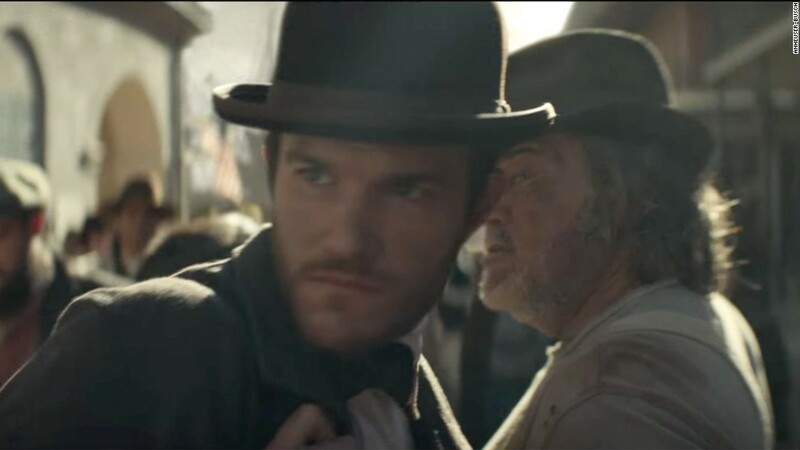 A Budweiser commercial also triggered a backlash for being anti-Trump and pro-immigration. The ad showed Adolphus Busch, one of the founders of Anheuser-Busch, journeying to the United States as an immigrant, only to be told he was not welcome. A spokesman for Budweiser said 78% of the social media reaction that the company tracked was positive. Airbnb's ad about acceptance said "we all belong" -- regardless of religion or country of origin. It didn't sit well with some Trump supporters. Coca-Cola's "It's beautiful" ad, which has aired since 2014, featured "America the Beautiful" sung in several languages. Coca-Cola said the ad "promotes optimism, inclusion and celebrates humanity" and did not address Trump's immigration order. Kia's commercial starred Melissa McCarthy, who appeared this weekend on "Saturday Night Live" and mocked the White House press secretary, Sean Spicer. The Kia ad, set to the song "Holding Out for a Hero," showed McCarthy encountering slapstick obstacles as she tried to save trees and ice caps. A hair product company called It's a 10 ran an ad that was far from subtle. Its message? "America, we're in for at least four years of awful hair." The idea was that we need great hair -- all types of it. @Itsa10Haircare @YouTube Why include a dig at POTUS? Why not just sell hair care & stay out of politics? No more 10 haircare items for me. CEO Carolyn Aronson said the response to the It's a 10 ad "has been overwhelmingly positive." "We are not a political brand," she said in a statement. "We created this ad to introduce the world to our brand in a lighthearted way. The focus is on embracing the diversity of America." Lady Gaga drew calls for boycotts both for the halftime show and for her spot for Tiffany & Co. Gaga's Super Bowl show conveyed a message of inclusion, and she chose to sing the lyrics of her hit "Born This Way," which promote LGBT equality. @greggutfeld Thank you Lady Gag for giving me a reason to boycott Tiffany. My Wife may be disappointed but I am elated. @nfl #BOYCOTTGAGA Lets show NFL that we don't like watching TRASH.Push OFF button when she comes on & BOYCOTT the sponsors.